A Springfield, Ohio, mother says she thought "it was fantastic" when her mail carrier delivered an Easter act of kindness to her teenage son, who has a rare genetic disorder. Tina McGrevy's son Garrett was born with Smith-Magenis syndrome, which causes him to become fixated on certain things. So when Garrett, 16, became obsessed with a guitar he saw at a local Goodwill store, he told his mother he wanted to write the Easter Bunny a letter asking for it. According to Genetics Home Reference, a website developed by the U.S. Department of Health and Human Services, Smith-Magenis syndrome or SMS is a developmental disorder caused mostly when a portion of chromosome 17 is deleted. It affects people in different ways, but mostly it causes delayed speech and intellect development along with other behavioral problems such as anxiety, tantrums, head-banging and other self-injury behaviors. Researchers said that 1 in 25,000 people worldwide are living with the disorder. A mail carrier in Springfield, Ohio responded to a teenage boy with Smith-Magenis syndrome, who sent a letter to the Easter bunny. "I knew he wouldn't stop asking for the guitar if he didn't get that letter," McGrevy, 44, told ABC News. The mother said that's why she played along when Garrett asked for her help to write a letter to the Easter Bunny asking for the guitar, along with "Dorothy the Dinosaur and Wags the Dog," two stuffed animals he had fallen in love with. Putting a square ticket on the letter "that Garrett thought was a stamp," McGrevy put it in the mail last Friday. "I just assumed it would get thrown away," she added. Instead, a day later the McGrevy's received a post-it note on their mail, saying that the Easter Bunny had received Garrett's note. "I heard that a letter from the Easter Bunny is on its way," the note read from the unidentified mail carrier. McGrevy said the mail carrier and her son have formed a bond because "Garrett runs out there to get the mail. I knew she knew Garrett so I knew the note was from [my local mail woman], but I don't know her. I don't even know her name," the mother said. 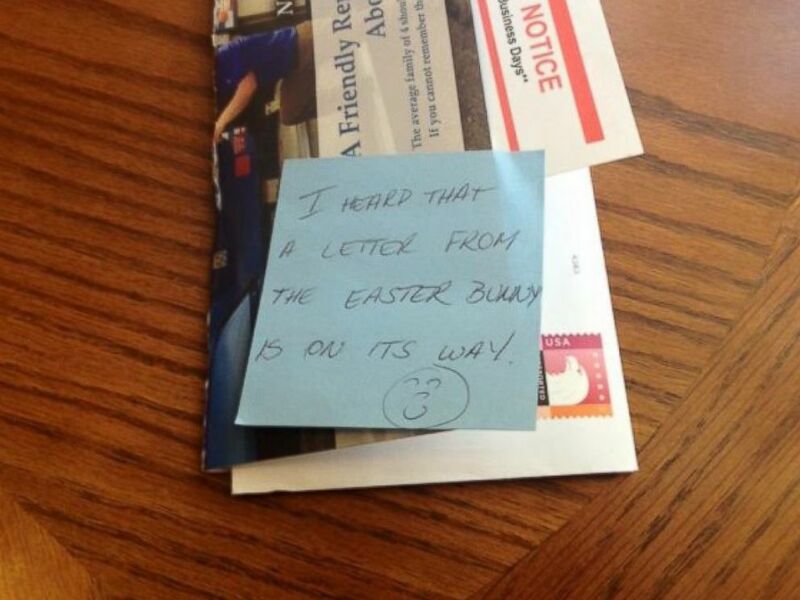 A Springfield, Ohio mail carrier helped the Easter Bunny reply to a teenage boy with Smith-Magenis syndrome. 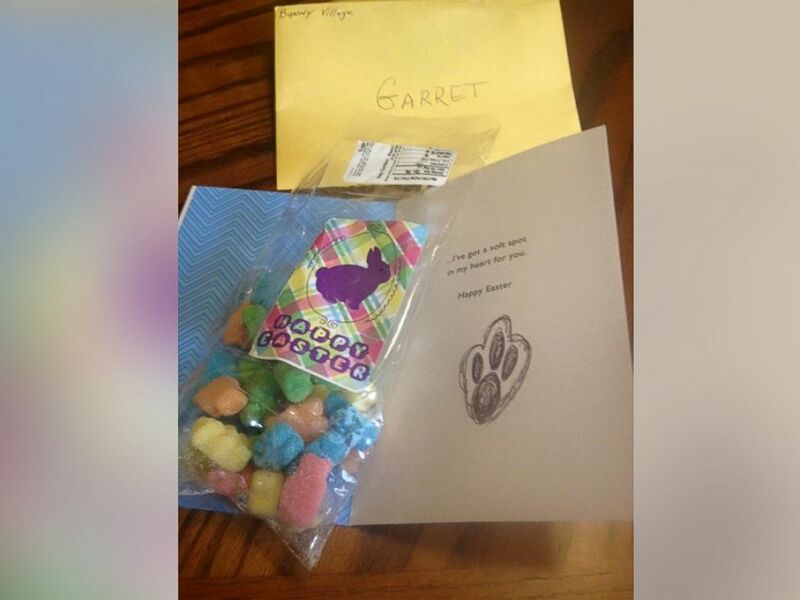 By Tuesday, Garrett received the Easter Bunny's card thanks to the kind mail carrier. The card -- sent all the way from Bunny Village -- also came with a small bag of candies. The card was even signed with a bunny rabbit paw print. "Garrett was ecstatic. He was jumping up and down," his mother said. "And I just thought it was fantastic. ... Garrett has SMS and it's very difficult for him to do a lot of things like go out to eat or go to the movies. He gets very overwhelmed. So when someone takes the time to get to know him, it means a lot to him and it means a lot to my husband and I. It made his day." McGrevy, who is also the awareness chairperson for advocacy organization Parents and Researchers Interested in Smith-Magenis Syndrome, noted that her son even sleeps with the card under his pillow. And to help the Easter Bunny fulfill Garrett's wish, she had to come up with a plan to purchase the guitar her son saw at Goodwill. After asking for her aunt Sheri Ehnie's help, McGrevy discovered that the guitar was already gone. Thankfully Ehnie turned to eBay to secure the Easter Bunny's very special gift for Garrett.